Bhopal birds are emerging group of enthusiastic people with a love of nature, a flair for identifying its different components and eager to do something for its conservation. It is registered under the Societies registration act. Birds and nature conservation through fields protection, awareness, education and scientific based action. Undertake scientific study of flora and fauna and takes action based research. To organize educational and awareness programmes for the protection and conservation of the flora and fauna. 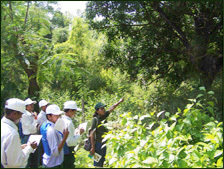 To develop actual protection and conservation work at field. To conserve nature and natural resources. Creating awareness to protect the biodiversity. To facilitate and encourage the study of birds. To assist in the enforcement of the laws related to the protection of wildlife.